Whether you knew it before or not, you definitely have to clean your iron. You’re ironing your favorite white shirt when — suddenly! — the iron leaves a brown mark on the sleeve. Darn! It could be caused by burned-on spray starch, melted synthetic fabric or rusty water in the reservoir. Whatever the reason, the soleplate of an iron should be cleaned whenever there is obvious residue or it no longer glides smoothly. 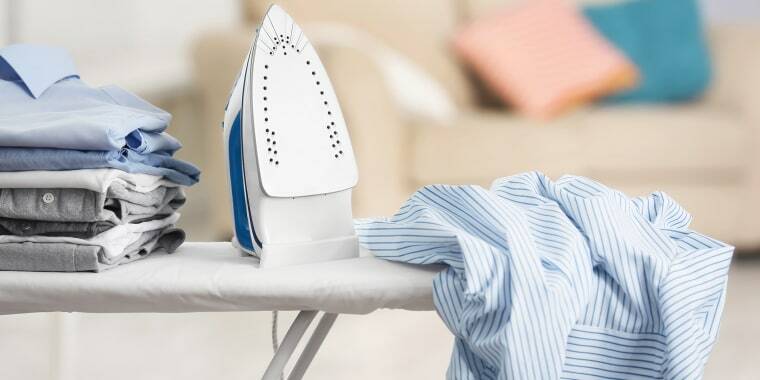 Follow these tips from Meg Roberts, president of Molly Maid cleaning service, to keep your clothing iron clean and iron marks a thing of the past. Start by turning the iron on to the highest setting (do not use steam) and run the hot, dry iron across the paper towel until it's clean. If extra abrasion is needed, sprinkle a tablespoon of salt on top of a newspaper and repeat. To rinse off residue, run the iron over a damp, clean towel after it cools. To remove oil from the soleplate, unplug the iron and allow it to cool. Wipe the entire soleplate with a cloth dipped in distilled white vinegar. Rinse with a damp cloth. If oily spots remain, wipe with a cloth dipped in ammonia. Rinse with a damp cloth. Dry completely. To remove mineral deposits from the soleplate, apply a paste of baking soda and water to the affected areas and scrub with a damp cloth. Wipe clean with a wet cloth. To remove mineral deposits from vent openings, scrub the vents using a cotton swab and some baking soda paste. Wipe clean with a wet cotton swab. If the iron is leaving brown water spots on clothes when using steam, that means it’s time to clean the reservoir. Empty the reservoir completely and refill with 1/4 cup distilled white vinegar and 3/4 cup distilled water. Turn the iron to full steam and run it back and forth over an old towel until the reservoir is empty. If the iron has a spray option, spray until the water no longer appears miscolored. Refill the reservoir with distilled water and repeat to make sure all mineral residue is gone. To prevent future stains and mineral buildup, use only distilled water (it doesn’t contain any dissolved minerals) and completely empty the reservoir before storing the iron. As always, follow the manufacturer’s instructions for cleaning your particular iron. If you’ve misplaced the owner’s manual, check if the online version is available on the manufacturer’s website. This article was originally published on Nov. 27, 2017.